As a key component of the bones, calcium plays a major role in the maintenance, and as a building block, of skeletal tissue. Although calcium has many different roles to play in cells of the body, such as acting as a neurotransmitter, or in the controlling of potential differences in cellular membranes, it is largely found — over 99% — in bone tissue and the teeth. Levels of calcium in the body are under careful, and tight, regulation. With the bone acting as a reservoir for storage of the mineral. The controlled regulation of the mineral allows for the correct management of a diverse range of bodily processes and functions such as blood pressure regulation, hypoparathyroidism, and prevention of Rickets, control of cholesterol, and weight control. As you can imagine these functions are extremely important in the body. As calcium is such an essential mineral in many of these processes, the body has a system in place to ensure that there is always an adequate supply of calcium available in the blood stream and in soft tissue. If there is not an adequate supply of calcium available then the body will send hormonal signals that will lead to demineralization of calcium in the bones, and thus allowing the mineral to become bio-available where it is required. One of the major roles of calcium, especially with regards to this website, is the part that it plays in bone maintenance and therefore its association with the osteopenia and osteoporosis conditions. As bone is a living tissue, it is subject to many every day stresses and strains; to keep it healthy the body makes use of specialized cells known as osteoclasts and osteoblasts in order for maintenance. The process in which damaged bone is removed, and then repaired by the body is called the bone remodeling cycle. In this process, osteoclasts carve out parts of the bone that have become damaged or weakened over time; this process is known as bone resorption. Conversely, the role of the osteoblast is to add and repair the bones with new material; this bone formation process is named ossification. 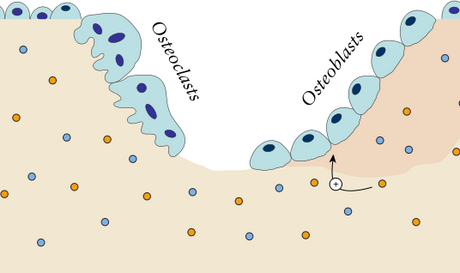 The function of osteoblasts and osteoclasts in the bone remodeling process. Image Source. The remodeling cycle adds and removes around 10% of bone tissue every year. Unfortunately, as people age, the efficiency of the maintenance of the bone modeling cycle goes askew — instead of removing and replacing bone tissue at the same rate, and there is an imbalance in the addition and subtraction of bone tissue. This process leads to the thinning of bones, and changes in microstructure that can lead to the skeleton becoming weak and prone to fractures. As the remodeling process loses efficiency when people age it becomes very important that people consume an adequate amount of minerals such as phosphorous, magnesium and calcium; and the vitamins D and K, in order to help the body carry out the essential maintenance of bone tissue as efficiently as possible. One, but not the only, of the major reasons for the prevalence of osteoporosis in society today is a consequence of people not eating a diet that is sufficient in the above-mentioned nutrients during their teen to mid-life years. Although many osteoporosis societies, organizations, and charities try to educate the public on the need for these nutrients in the diet, this advice is often ignored. In fact, only 10% of girls and 25% of boys get an adequate supply of calcium during their formative teenage years in the USA. One of the reasons why this is thought to be the case is because one of the major sources of calcium for young people is Milk. When children reach a certain age, they have a tendency to replace this calcium rich drink with soda. Perhaps the major reason why dietary advice is ignored by adults is because osteoporosis is a silent disease; that is to say that people do not realize they are developing weakening bones as they can not see them thinning without the aid of DEXA bone mineral density testing. Indeed it is often the case that a person does not realize that they have osteoporosis until they have been diagnosed it following a fracture. As mentioned previously over 99% of the body’s calcium is stored in skeletal tissue. It therefore comes as no surprise that this mineral plays a major role in the maintenance of a strong skeleton and that a deficiency of calcium in the diet can lead to the thinning of bone tissue, and is therefore directly related to the development of the osteopenia and osteoporosis condition. Calcium storage within the bones occurs mainly in the form of calcium phosphate and calcium sulfate. When calcium is stored in the bones, and calcified cartilage tissue in this form, it is usually not available for exchange with calcium in other parts of the body without the use of the basic multicellular units (osteoclasts and osteoblasts). As the bone remodeling process loses efficiency as a person ages it is important to consume adequate amounts of calcium. If person does not have an adequate amount of calcium in other parts of the body, such as the plasma, and at cell membranes, then the endocrine system will signal the osteoclasts of the bone basic multicellular units to remove calcium from the bones to compensate for the low external (to the bones) levels. Unfortunately, as the osteoblasts are now working with less efficiency they are not able to replace calcium as effectively in the bone tissue when it becomes abundant again. Therefore, over time, there will be a net loss of calcium from the bone tissues. Furthermore, the actual structure of the skeleton that the osteoblasts have added calcium to is likely to be less well-formed. This will lead to thinner bones, with a weaker micro-architectural structure. It is therefore essential that a person consumes an adequate amount of calcium in order to help in limiting the quantity of the mineral that is lost from the bones through hormonal action involved in the tight regulation of the body’s calcium levels. It is hoped that you now have a good understanding of the link between calcium and osteoporosis, and why there is a need by the body for this mineral; this in itself will give you a better grasp of the pathophysiology of osteoporosis; but there are still many questions that still need to be addressed. What are the dietary forms of calcium available? What are the available forms of the mineral in supplementary form? How much calcium is required? Are there any side effects? Can calcium supplements be safely consumed with osteoporosis drugs such as bisphosphonates? We will address these questions in the next section. The following recommended dietary allowances are supplied by the FNB in the United states. It may be the case that your country’s recommended allowance differs from the information supplied in this table. Nonetheless, they act as a good starting guideline. There are many foods that are great sources of calcium. Perhaps one of the most well known sources are dairy products such as Milk, Cream, Cheese, Yoghurt and Butter. There are also many non-dairy sources of the mineral, and people who are lactose intolerant may consider adding fish to their diet. Vegans may wish to consider consuming vegetables like Broccoli, Cabbage, Kale and Turnip Greens, fruits such as Blackberries, Papayas and Mango; and certain nuts (Almonds; Walnuts) and seeds. 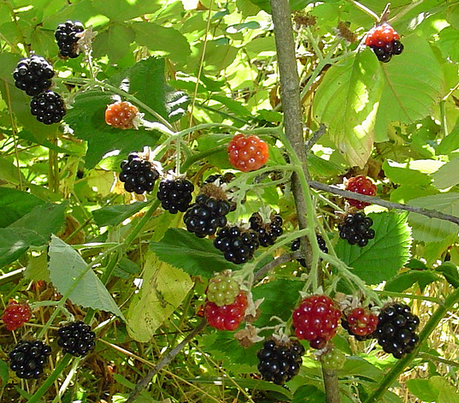 Blackberries are a great source of natural calcium. Photograph by born1945. It is good to beware that many plants contain oxalic acid. This inhibits the absorption of calcium in the bones. It is found in large amounts in Spinach and Rhubarb; and in somewhat smaller, but still adequate amounts in beans and sweet potatoes. Therefore, if your only source of calcium is from vegetables you may need to consider your consumption of oxalate containing vegetables, or perhaps make use of calcium supplements. The following table of calcium levels in food is based on information from the USDA’s National Nutrient Database. For most people it is fairly easy to get adequate amounts of calcium through their diet. One of the advantages of getting calcium in this way is that foods rich in calcium are often a good source of other nutrients, many of which, Vitamin D and magnesium for example, also play an active role in the maintenance of bones. Although it is recommended to get calcium through your diet, for many people this can be quite difficult; this is especially the case for vegans, people following certain diets, and people who have intolerance towards lactose. Fortunately, there are many calcium supplements available on the market. When taking these supplements it is important to realize that your only a certain amount of calcium can be absorbed at once; this is in the region of 500 mg. If you require a greater supplementation of calcium than this, then it is important that you spread out your intake of supplements over the course of the day. Otherwise, you will not achieve full absorption of the calcium that you consume, meaning that you will still not be consuming enough calcium for your bodily needs despite the fact that you have taken the correct amount of supplementation. There are two major types of calcium supplements on the market, and these vary in both price and quality/ The more expensive kind comes in the form of Calcium citrate; this form is easily digested by the body, and can be consumed at any time; either with or without food. The other major form of the supplement is calcium carbonate. This form is cheaper, but harder for the body to absorb. Unlike with the citrate forms, calcium carbonate should be taken alongside food or orange juice has it requires stomach acid to as part of the absorption process. Other common forms of calcium used for supplementation include calcium lactate and calcium gluconate. If you do require calcium supplements for osteoporosis then it is recommend by the OA, that the dose should be in the range of 500 to 700 mg per day, and ideally, the supplement should also include Vitamin D; at least 800 IU is required daily for calcium to be effective in preventing hip and non-vertebral fractures. It is also possible to find products that contain magnesium and vitamin K, these may be ideal to use for people who are unable to get an sufficient supply of nutrients through their diet. There are many things to bear in mind when taken any form of supplements, and calcium is not an exception to this rule. It is very important to talk with your doctor about potential problems if you are taking medication or suffering from certain ailments. You should be especially careful of taking calcium supplements if you have previously had kidney stones, have hyperparathyroidism, cancer, or sarcoidosis amongst others should definitely avoid speak to their medical practitioner before taking calcium. There are many side effects that are associated with high levels of calcium; the maximum amount of total calcium intake per day should not exceed 2,500 mg. Problems and health issues associated with excess levels of the mineral include, but are not limited to, increased risk of heart attacks, increased chances of developing prostate cancer, nausea, constipation, irregular heart rhythms, and kidney damage. It is noteworthy that elevated blood calcium levels have never previously been reported to occur through food consumption alone, but only in cases when supplements have been taken. It is known that calcium can interfere with the absorption of many of the bisphosphonates that are used in the treatment of osteoporosis. To prevent this your doctor may recommend that are not consumed until at least two hours after you have taken your bisphosphonate based osteoporosis drug such as Fosamax, Actonel, Boniva or Reclast . Other none osteoporosis calcium interactions effects include medications for blood pressure, cholesterol lowering drugs, aluminum containing antacids, estrogens, thyroid hormones, water pills, Digoxin, corticosteroids, dovenex, certain antibiotics (for example tetracyclines and quinolones), anti-seizure medication: and many others. It is best to avoid calcium that sourced from coral, oyster shells, bone meal and dolomite, as these often contain large amounts of lead; a toxic metal that is associated with many major side effects, including kidney and brain damage. It is hoped that you now have a better idea of why calcium is required by the body for both structural and cellular purposes. The bone remodeling process has been discussed, but perhaps the main take-home points are that it becomes less effective as a person ages, and that if there is not enough calcium available to the body for cellular purposes that hormonal action will stimulate the osteoblasts to remove calcium from the bones. In addition to calcium, other minerals and vitamins are also required by the mechanisms that control the bone remodeling cycles. It is recommended that you consume the RDA of the mineral through the inclusion of calcium rich foods in your diet, if possible. If you must go down the supplementation route, then it is important to realize that elevated calcium levels can be problematic, and that the mineral can have a negative impact upon the absorption of osteoporosis drugs. If you are taking any form of medication, it is very important that you speak to your health care provider if you plan to take supplements of the mineral.